RadioTray is a minimalistic radio player stat runs in the notification area (system tray). 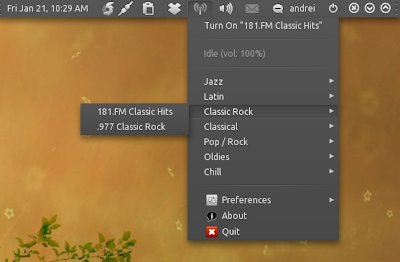 Finally a new version of RadioTray was released which adds support for Ubuntu appindicator, a new command line parameter "--resume" to play the last radio station before RadioTray was shutdown and a new sleep timer so you can go to sleep while listening using RadioTray. These features were actually included in the 0.6.2 version which was released yesterday but a bug prevented it from running so version 0.6.3 was released to fix that. 1. Download RadioTray Ubuntu .deb from Sourceforge and install it normally. If you encounter any issues, read on. If not, enjoy RadioTray! And change the value for "option name="enable_application_indicator_support"" from "false" to "true".